Bright, complex, wide, outer loop/cavity with inner, 'light-bulb'-shaped loop/cavity and structured, complex (prominence?) core superposed on faint fan (or streamers). Big deflections. Region is blown out. Solar north is toward the upper left in each image. Event is wider; southern edge of mass ejection is beyond the sector boundary field of view. 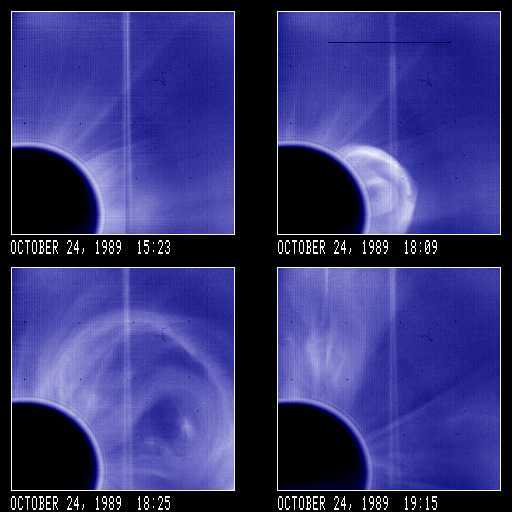 October 24, 1989: 19:15 UT October 24, 1989: 4 Images in one frame.